If you were to fall madly in love with someone, you'd want the world to know. If your favourite sports team won the top spot in their league, you'd want the world to know. If you discovered the ultimate cure for all types of cancer, you'd want the world to know. So doesn't it make sense that now you've been forgiven by God and started a lifelong friendship with the Creator of the universe and the Saviour of your soul ...you want the whole wide world to know? 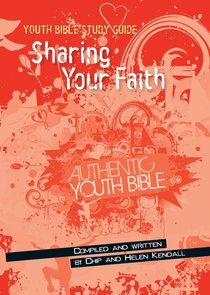 About "Sharing Your Faith (Youth Bible Study Guide Series)"
Chip Kendall and his wife Helen are Creative Arts Pastors at Audacious Church, Manchester. Chip, once in thebandwithnoname - which took the gospel into schools in the UK - now tours with the Chip Kendall Band. Chip's first book The Mind of chipK: Enter at your Own Risk and his and Helen's contributions to the Authentic Youth Bible and Youth Bible Study Guides have helped many young people grow in their faith. Chip and Helen have three young children and live in Stockport, England. Helen Kendall and her husband Chip are Creative Arts Pastors at Audacious Church, Manchester, UK. She has been a co-contributor to the Authentic Youth Bible and Youth Bible Study Guides, which have helped many young people grow in their faith. Chip and Helen have three young children and live in Stockport, England.